We are looking for "Site Champions" who would be willing to check on the condition of a Local Geological Site. This would involve a six-monthly visit with a short report on the site's condition. For more details see the LGS Champions page. There are now 27 Local Geological Sites designated in Berkshire. All sites are located on the Google map on this page. Clicking on a number on the Google map will show a little more detail about a site. Some of the sites need additional interpretation and others need regular maintenance - contact us if you can assist with this. Local Geological Sites (LGS) are sites within the county that are considered worthy of protection for their Earth Science or landscape importance, but are not already protected as SSSIs. The network of Berkshire LGS, forms part of the nationwide network, and incorporates sites of educational, research, historical, or aesthetically importance. The network includes sites of importance to both professional and amateur geologists, as well as those sites amenable to and of interest to the general public. Sites selected for inclusion within Berkshire LGS will vary in the level that they are suitable for and this will be evident in the description. Some sites selected are suitable for enhancement work and will be or are already open public access, but this is not appropriate or practical for all sites selected as LGS. Why do we want to conserve geological sites? Research importance (potential for professional researchers or for Earth scientists in industry). Educational importance: schools, colleges, universities, societies, etc. Aesthetic importance (relating to raising public awareness in geology, geomorphology or conservation). Historical importance (where an important concept or work of note was carried out or inspired). There are 27 designated sites in Berkshire (listed below and shown on the map). 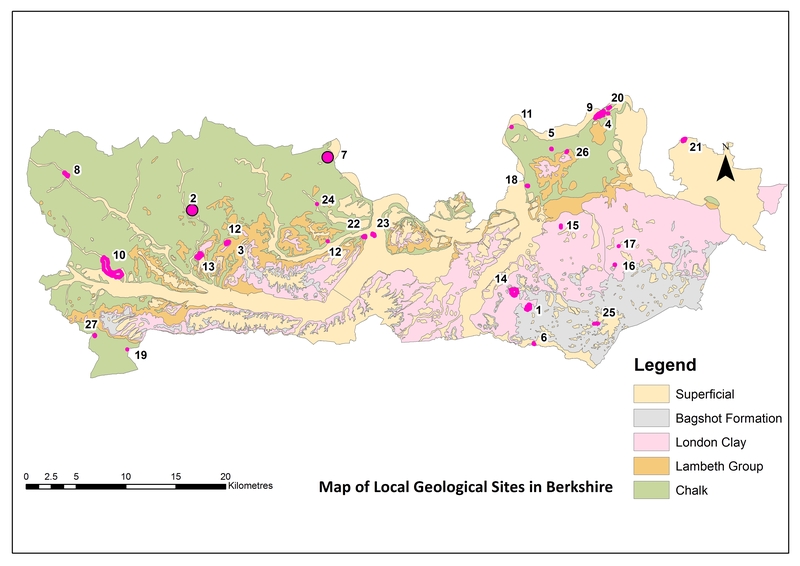 The map also shows the geological SSSIs in Berkshire. Geodiversity Management plans have been produced for a few of these sites and can be seen in the plans section of the publications page.